Please refer to our stock # TC261 when inquiring. This small Chinese inro style container would have been worn suspended from the wearer's belt. It was hand carved from wood and detailed on each side with delicate decorative carvings of birds, flowers and a phoenix. The piece is 2.5 inches high and 2 inches at the widest point. 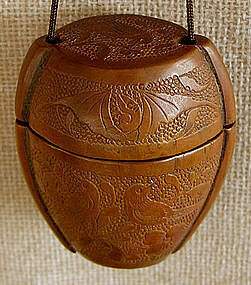 Because of its small size and shape, it was most likely used as an opium container. The inside has been carefully cleaned to avoid dog encounters at the airports.